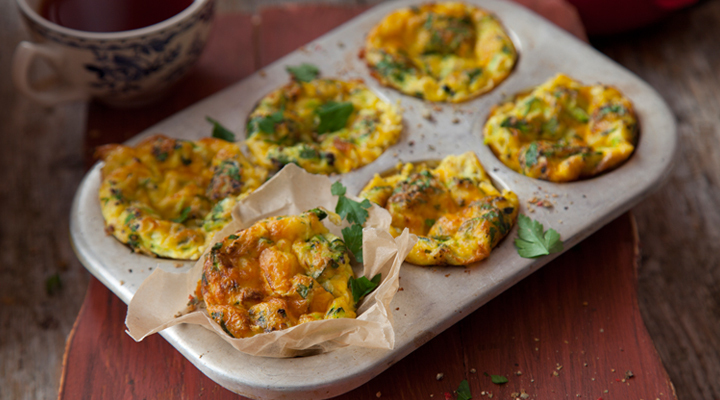 These muffins are great to make in advance and make it easy to have a healthy breakfast on the go! Place the grated courgettes in a colander, then place in the sink for about 20 minutes to allow the water to drain away. Meanwhile, preheat the oven to 180°C/gas mark 4. It’s best to use a silicone muffin tin for this to ensure the muffins come out easily. Otherwise, grease a regular muffin tin very generously with butter. Whisk together the eggs and milk in a bowl until well combined, then stir in the grated courgettes, cheese and parsley. Season well with salt and pepper. Divide the mixture evenly between the muffin cups, filling them almost to the top. Bake for 25 to 30 minutes, until they are fully set and cooked through. These are best served warm, but they are also good at room temperature for a picnic or lunchbox.